The issue of animal rights begins with the question of what sort of beings are deserving of moral regard. Do we only treat human beings or include animals as well? It also begs the question, how are we supposed to treat animals? Do they have moral rights? When animals suffer, can we equate it to human suffering? Should we ban both experimentation on animals and large scale commercial farming of animal? What is the moral status of animals? Do we have a moral obligation to become vegetarians instead of eating animals? Peter Singer in 1975 wrote a book Animal Liberation which launched the animal rights movement. It was and is a call for an end to human tyranny towards animals. It was a call to end the pain and suffering of animals. In fact, Peter Singer likened the tyranny on animals with that of white humans over black humans. Peter Singer position today is classified as utilization following on Jeremy Bentham’s agreement for sentiency as the bar we should use to measure morality as opposed to reason. The argument runs as follows. Since all sentient beings have the ability to suffer, it follows that they have interests. And since they have interests, when these are frustrated, it leads to suffering. Being a utilitarian, Singer’s position is one that seeks to maximize satisfaction of interests whether they are of humans or animals. What about Tom Regan’s position? Tom Regan on the other hand adopts a deontological rights position which is the view that animals, like men are “ends in themselves” and therefore ought not to be exploited. Animals and humans have equal rights. In fact, to Regan, animals have similar essential properties like humans with regards to desires, memories, and intelligence and so on and this therefore gives them equal intrinsic value like humans. Regan is more radical than Singer. Why? He calls for the total end to commercial animal farming, all hunting and trapping of animals, all animals’ experimentation even eating of animals. 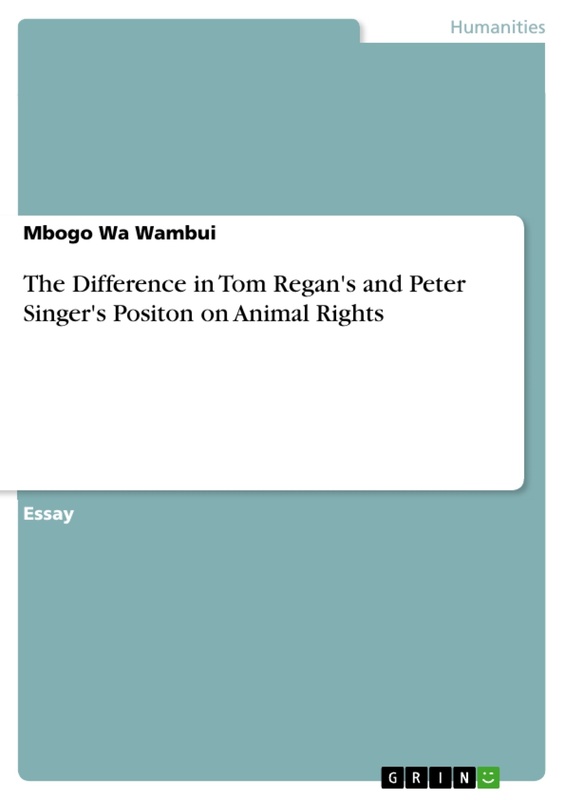 Let us now contrast Tom Regan’s position with that of Peter Singer Tom Regan is a professor of philosophy at North Carolina State University and is a leading animal rights advocate in the United States. Regan begins his article by noting the commitments of the animal rights movement (i) they are committed to the total abolition of the use of animals in science, (ii) the total dissolution of commercial animal agriculture, (iii) the total elimination of commercial and sport hunting and trapping. He notes that there are people who claim to believe in animal rights but see nothing wrong in say hunting of animals, tests on animals. Regan argues it is unjust on the animals and tidying up institutions will not do. According to Regan, what is fundamentally wrong with the way we treat animals are not the details that change from time to time but the whole system. However, Regan forcefully argues that how we treat farm animals does not need ‘more human’ ways, what is required is the total dissolution of commercial animal agriculture. Since the abolition of such farms is not easy, it requires a change in people’s belief before they change their habits. This process is very complicated and long. It will need a change in education, publicity, political organization and activities against the treatment of animals. In order for us to proceed, we must ask ourselves the moral status of animals by those who deny that animals have rights According to Regan, morality consists of a set of rules that individuals voluntarily agree to abide by. It is a form of a contract where we spell out modalities to be used even on those who lack the ability to understand morality and therefore cannot sign the contract themselves. These include children who are protected by the contract even though they do not know what is in it, duties regarding them, our duties towards them as parents but not duties to them as children. This begs the question, how about animals with no contract they can understand or sign, do they have rights? Regan argues that yes they have rights. If your dog is kicked, you get offended because the dog has been treated badly. The bald eagle is even protected by law for its sentimental value. We seem to think that animals have no rights and this is not so. Cruelty, according to Regan shows a lack of sympathy or worse sometimes, the presence of enjoyment in seeing the suffering of another. This means we ought to be kind and sympathetic to animals just as we are to fellow human beings Perhaps where the biggest distinction will be seen is Regan’s treatment of utilitarianism. Assuming that he wants to build a children’s hospital but has no money, Regan conspires with this doctor treating his old but not so good aunt and together they kill her, get the money and a children’s hospital is established. Is not this a good thing? Many sick children will now be treated as opposed to old no so good lady. As a utilitarian, this is maximizing the good for the largest number of people possible. This is the view utilitarian’s hold with regards to treatment of animals and is flawed. In order for us to redress the situation, we must determine the moral status and worth of every sentient being. Regan therefore comes up with the rights view which addresses the foundation of our duties to one another as humans and by extension, towards animals. We must recognize that our value as individuals is independent of our usefulness to each other. Likewise animals have inherent value and sanctity of life that ought not to be violated. Animals do not have lesser inherent value than we do, Regan argues. Inherent value belongs equally to those who are experiencing subjects of a life. Regan forcefully argues that reason compels us to recognize the equal inherent value of animals and their equal right to be treated with respect. If we cannot justify the killing of a human being for utilization reason, like wise there is no justification in killing rats in the laboratory. The rights view therefore calls for the abolition of commercial animal’s agriculture. Giving animals more space, better treatment will not do. Nothing less than the total dissolution of commercial animal agriculture will help. Regan concludes that the task of liberating animals. What then are Peter Singer’s views on animal rights? According to peter Singer, liberation of all forms needs an expansion of moral horizons, extension and re-interpretations of basic moral principles of equality. We need to make a mental switch with regard to our attitudes towards animals. We need to consider the equality of animals as well. Singer argues that just as we are against racism, sexism, we should be against speciesism. Possessing a high degree of intelligence does not entitle one human to exploit another and also for humans to exploit non-humans.